If you’re planning to visit northern Thailand, don’t miss the Instagram-famous White Temple, aka Wat Rong Khun. Read this post for 11 tips for making the most of your visit to this incredible temple. 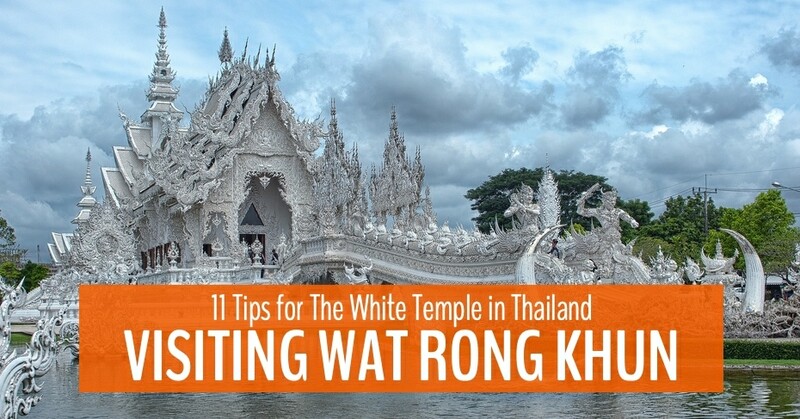 What’s in our guide to visiting Wat Rong Khun? Wat Rong Khun is a weird and wonderful place that every visitor to Thailand should experience. It is an equal parts bizarre and incredible temple outside the city of Chiang Rai in northern Thailand. On our visit to the temple, we were surprised and bemused by the inherent craziness in the design. It is as much a modern art piece as it is a religious building, as tacky as it is beautiful. One thing is for sure though, if you’re in the area, The White Temple is well worth a visit. If you’re in northern Thailand, you should make time to visit Wat Rong Khun. If you’re under your own steam just set an early alarm and get there for 8am when the temple opens. If you’re taking the bus, or hiring a tuk-tuk (details of all of that below), then make sure you tell them you want to go early. The crowds get crazy busy and it gets hot pretty early. You don’t want to be caught out in the midday Thai sun! 2. Stop for coffee at Doi Chaang. Drink locally! If you start your day in Chiang Rai, there is a Doi Chaang coffee shop near 75th Anniversary Flag and Lamp Park that opens at 7am. This is great place to stop for local coffee before you hit the temple. As a bonus, the coffee is grown in the mountains around Chiang Rai and Wat Rong Khun. Double bonus, they also offer breakfast (but not for vegans). The beauty of the White Temple is surpassed only by its strangeness. It’s easy to get to Wat Rong Khun temple by public transport. There is a public bus from the Chiang Rai bus station. The bus to the temple drops you off a short distance away from the temple, on the other side the highway. There is a light at the intersection, so crossing the highway is easy. To get back, cross the road the temple is on, walk down to the highway, turn left and find the wooden bus stop gazebo in front of the police kiosk. Flag the first bus you see. They come every half hour or so and the journey back is another 20 THB. If you want to get to Wat Rong Khun from Chiang Mai, there are lots of bus tours you can book with your hotel or hostel. Cost is roughly 450 THB ($14 USD). 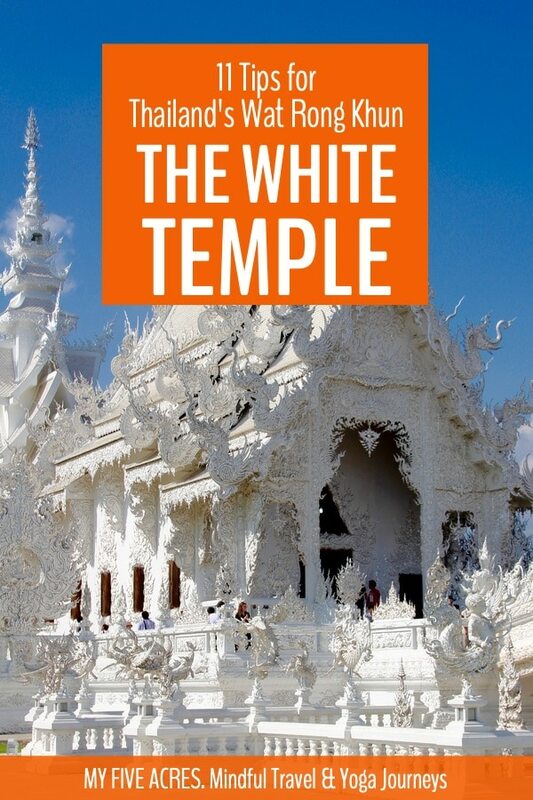 To combine a trip to The White Temple, The Black House, and The Blue Temple from Chiang Rai, check out this highly-rated tour. If you want to get to the White Temple from Chiang Rai but don’t fancy taking a bus, you can rent a scooter for the day, or hire a tuk-tuk for a few hours. You can arrange for a tuk-tuk to pick you up around 7am for the roughly 35-minute ride out to the White Temple. Pre-arrange for your driver to wait for an hour or 90 minutes (that’s lots of time to wander around the temple) and take you back. You should be able to organise all of this for roughly 400 THB ($13 USD). If you want to feel the wind in your hair (under your helmet), rent a scooter for about 250 THB (~$8 USD) a day. We have heard good things about ST Motorcycle Rentals at 1025/34 Jetyod Road, near the Clock Tower. Of course, Wat Rong Khun features many depictions of Buddha in all his forms. It’s essential as a mindful traveller that you dress appropriately when visiting Thai temples. At Wat Rong Kunh (also known as Wat Rong Kung, Wat Rong Kun, etc) cover your shoulders and wear pants or a skirt that covers your knees. Unlike other temples, where they will remain silently offended if you dress disrespectfully, at the White Temple, the dress code is strict. If you don’t have your knees covered, they will give you long skirt or sarong to cover yourself. If you book a tour to The White Temple, it will likely include your entry cost. Make sure you know in advance if it does. If you make your own way to the temple, you can pick up your ticket when you arrive at the temple. There is an easy-to-spot ticket booth at the entrance which will most likely have a queue of tourists. Admission for foreign tourists is 50 TBH ($1.60), Thai nationals get in free. The temple is open between 8am and 5pm daily. Come early to ensure you have enough time to enjoy the views before the bus tours start rolling in! Like much of Wat Rong Khun, we just didn’t know what was going on here! 8. When should you visit The White Temple? Go early on a weekday. Weekends are crazy at the temple! The White Temple opens at 8am, so be in the queue for tickets by that time. Why? The temple has thousands of visitors each day and you don’t want all of them in your photos. Also, it’s quite hard to appreciate the strange beauty when hundreds of school kids are running rings around you. Midday sun is terrible for your travel photos. If you get there early, and you’re lucky, the light just might not be too harsh on the white walls of the temple. If you arrive around 7am, you can take photos of the exterior before the temple opens and before the tour buses arrive! If you’re shooting photos on your phone, I recommend using a camera app that lets you easily change the exposure. You’re going to want this when the sun is bouncing off the temple! I use Camera+ on my iPhone. It’s pretty easy to use and you can even shoot in RAW with the app, giving you more editing possibilities later on. To edit photos, we use Snapseed and Photoshop Express. Get to Wat Rong Khun before opening time if you want pictures without tourists. Don’t step on Predator rising out of the temple grounds. But also don’t miss seeing it, because what other temple do you know that features an alien from a blockbuster film? Have we mentioned it’s a very weird place? Don’t miss the bathrooms. Everyone raves about them. They’re in the gold building before you leave the temple. We won’t spoil the surprise by giving you too many details. Just make sure to check them out! You’ll get to do some incredible cycling on this northern Thailand tour. Want to do your own bike tour from Chiang Mai to Chiang Rai? Grasshopper Adventures makes bike touring easy so you can focus on seeing the sights. Cycle the country knowing your hotel is booked, your luggage is waiting for you, and amazing meals are on the way. We know you’ll be loving Thai cuisine as you travel around the country. Why not take some of those amazing flavours home with you? You can, by joining a cooking class in Chiang Mai. Find more great hotels with our favourite hotel booking site, Booking.com. We went to Wat Rong Khun as part of a much longer adventure — 19 amazing months on the road cycling through 22 countries. If you’re interested in travelling by bicycle, or just want to know more about off-the-beaten-path Southeast Asia and Europe, check out our cycling stories. Pin this for your Thailand trip! Pingback: Ways To Beat The Heat | My Five Acres. Travel. Adventure. Yoga. 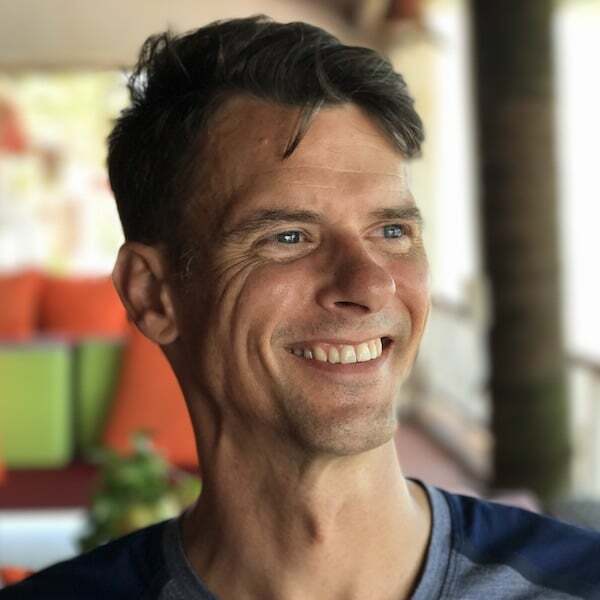 Pingback: Taking The Thai Road | My Five Acres. Travel. Adventure. Yoga.